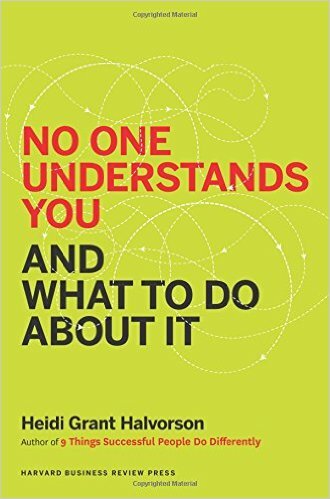 Among Listen Like a Lawyer’s summer reading is Heidi Grant Halvorson’s No One Understands You and What To Do About It (Harvard Business Review Press 2015). Halvorson is a professor at Columbia Business School; here she is interviewed by CBS News about the book. Your emotions are less obvious than you realize, and your face is less expressive too. Studies show that while very strong, basic emotions—surprise, fear, disgust, and anger—are fairly easy to read, the more subtle emotions we experience on a daily basis are not. Trust is based on two factors—warmth and competence—that may sometimes be at odds with each other. More on that in a moment. The ego plays games with perception so that the perceiver comes out on top. Understanding ego dynamics can help a person avoid being seen as an ego threat. The least manipulative-sounding of these is focusing on how the speaker and perceiver are members of the same group (such as alums of the same school or members of the same profession). These lenses are at work in difficult situations that lawyers and legal professionals face every day. A few that come to mind: clients who resist signing settlements that are strongly in their favor; supervising lawyers who want to control conversations with clients; legal professionals who gain a reputation—either for good or poor work—that seems difficult if not impossible to alter. All of these lenses could help with the goal of listening, in that knowing about them can help a listener understand better what the other person is saying and why. Developing trust by cultivating warmth was where listening came into play explicitly. Some warmth tactics seem obvious: make eye contact, smile, and focus. But Halvorson cites studies that “people generally have no idea when they are not doing these things.” One practical theme of the book is just to ask friends and family about how you come across: do you make eye contact? How do they perceive you? When people are trying to appear warm, they are agreeable, engage in flattery, make kind gestures, and encourage others to talk (i.e. they are good listeners). But when they want to appear competent, they do the opposite–speaking rather than listening, focusing the conversation on their own accomplishments and abilities, and challenging the opinions of others as a demonstration of their own expertise. In fact, both consciously and unconsciously, people tend to use this knowledge and play down their competence (i.e., play dumb) to appear warm, and vice versa. Halvorson notes this conflict is a particular conundrum for “nontraditional women” who may experience particularly virulent sexism for perceived failure to adhere to stereotypes about women. This is an example where she nods to the deep and troubling excesses of cognitive biases, but this book is not the place to look for introspection or sensitive exploration of stereotypes and what to do about them. Halvorson also has chapters for difficult interactions such as those with “vigilant risk-mitigators” and “aloof, avoidant perceivers.” She closes with a relatively short treatment seeing others more clearly (e.g., “take more time” and “consider evidence for and against” a hypothesis) and even seeing yourself more clearly. A common thread throughout the book is to ask friends, family and (if you dare) colleagues how you come across. If people consistently perceive you in ways you don’t intend, then reading, re-reading, and working on the ideas in this book may be in order. Perception and decision-making are vulnerable to cognitive biases. Decisions based on listening are at least as vulnerable to bias as other forms of decision-making, if not more so. Previous posts in this series (here and here) have outlined the vulnerability of listening to bias and have addressed some of the most common cognitive biases. This concluding post highlights two more biases, how listening might play a role in these biases, and what lawyers can do to minimize their effects. A lawyer and client go to mediation after discussing a number that they would be willing to pay to settle. In the first round of the mediation, the other side has the first opportunity to offer a number. Its opening demand is ridiculously high and nowhere near what the lawyer and client had discussed. What is everyone in the room to do with that very large number? The lawyer and client may start to worry that this opening number will influence the mediation. And the research on cognitive bias confirms that the lawyer and client are right to worry. The “anchoring effect” will tend to pull negotiations toward the number that any side puts out as the first “anchor.” One of several excellent law review articles discussing the anchoring effect is Blinking on the Bench: How Judges Decide Cases by Chris Guthrie, Jeffrey Rachlinski, and Andrew Wistrich. Hearing an anchor—rather than reading it in a written demand or brief—could exacerbate anchoring bias. The act of reading is often private; you can go in your office and close the door to read a demand letter and digest it. You can take time to marshal your own mental arguments against it, and the arguments of others as well In contrast in many situations where you hear the anchor, you are on the spot with a client and the other party. So the vulnerability to the anchoring bias may come not such from hearing the number but more from hearing the number in person, under pressure. Be attuned to the physiological effects of “hearing the other side’s number.” Hearing the number may provoke body language in us as listeners that reveals our thought process. Knowing the power of the “anchor” could help lawyers to preemptively temper their own reactions. They may help clients do the same by preparing them to hear a large number and explaining strategies for dealing with the experience. Purposefully brainstorm all arguments against the anchor. Kahneman points out that this strategy is helpful for managing one’s own thoughts about a potential anchor. It could also be used for persuading others such as mediators and judges that a number is not appropriate and should not be the anchor. We are more vulnerable to certain biases when we are simultaneously engaging in another “effortful task,” according to Kahneman. This is the connection back to cognitive load: the busier our cognitive resources are, the more vulnerable we are to cognitive bias. Our overloaded critical-thinking skills take a break and let our intuitions do the work—along with our intuitions’ embedded biases. The “availability bias” is one such cognitive bias. The concept is that our thought processes become skewed by how easy it is to recall certain information. If information is available, it seems more important and vivid and likely to happen again. That is why Kahneman and others complain about media coverage. If newspapers regularly run articles about lawyer misconduct, the availability of that information may influence the public to believe lawyer misconduct is more common than it really is. With this cognitive load as the context, there is a chance the lawyer’s estimate of success or failure on the Smith case will be affected by the availability bias. The lawyer’s ease of remembering cases like the Smith case may play a disproportionate role in the analysis. The lawyer’s most recent experience related in some way to the analysis in the Smith case may also distort the lawyer’s thinking. The availability bias may arise in the listening context in a few ways. The real-time flow of listening may not give a listener time to thoroughly process and critically examine some analytical questions. Distractions or cognitive load from the act of listening itself may exacerbate the bias. And talking about issues that are not in one’s true area of expertise could play a role as well. Biases could snowball as a lawyer who likes the client and is happy about a new matter (affect bias) offers a tentative answer and then seeks reasons to support it (confirmation bias), which are supplied in part by the ease of remembering one or two cases that are somewhat similar (availability bias). Monitor distractions and cognitive load, and preserve time for deeper focused analysis. Distinguish your own areas of deep expertise from areas of moderate experience. Remember that what you say to a client may trigger the client’s own availability bias. Thinking out loud with the client in the room could alter the client’s perception about the legal analysis in unintended ways. Because listening involves perception and is so intertwined with thinking, it is vulnerable to cognitive bias. By understanding more about how cognitive biases affect their perceptions and their thinking, lawyers can take steps to counteract the effects of these biases. Reflecting on biases and taking steps to reduce them can help lawyers reach the elusive goal of being not just good, but gifted, at listening.